Star Wars: Episode III – Revenge of the Sith is a 2005 American epic space opera film written and directed by George Lucas. It is the sixth entry of the Star Wars film series and stars Ewan McGregor, Natalie Portman, Hayden Christensen, Ian McDiarmid, Samuel L. Jackson, Christopher Lee, Anthony Daniels, Kenny Baker, and Frank Oz. A sequel to The Phantom Menace (1999) and Attack of the Clones (2002), it is the third and final installment in the Star Wars prequel trilogy. The film begins three years after the onset of the Clone Wars. The Jedi Knights are spread across the galaxy, leading a massive war against the Separatists. The Jedi Council dispatches Jedi Master Obi-Wan Kenobi to eliminate the notorious General Grievous, leader of the Separatist Army. Meanwhile, Jedi Knight Anakin Skywalker grows close to Palpatine, the Supreme Chancellor of the Galactic Republic and, unknown to the public, a Sith Lord known as Darth Sidious. Their deepening friendship threatens the Jedi Order, the Republic, and Anakin himself. Lucas began writing the script before production of Attack of the Clones ended. 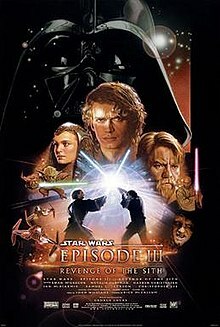 Production of Revenge of the Sith started in September 2003, and filming took place in Australia with additional locations in Thailand, Switzerland, China, Italy and the United Kingdom. Revenge of the Sith premiered on May 15, 2005, at the Cannes Film Festival, then released worldwide on May 19, 2005. The film received generally favorable reviews from critics, especially in contrast to the mixed reviews of the previous two prequels: praise was directed towards its action sequences, mature themes, musical score, visual effects, and the performances of McGregor, McDiarmid, Oz, and Jimmy Smits; criticism was aimed at the film’s screenplay, inconsistent tone, and Christensen’s performance. Revenge of the Sith broke several box office records during its opening week and went on to earn over $848 million worldwide, making it, at the time, the third-highest-grossing film in the Star Wars franchise, unadjusted for inflation. It was the highest-grossing film in the U.S. in 2005 and the second-highest grossing film worldwide, behind Harry Potter and the Goblet of Fire. The film also holds the record for the highest opening day gross on a Thursday, making $50 million.